For the CARIBE WAVE 2019 Exercise, two scenarios have been proposed for the participants: the Kick ‘em Jenny Scenario and the Panamá Scenario. The first scenario simulates a tsunami generated by a flank collapse of the Kick ‘em Jenny submarine volcano. This collapse occurs after a magnitude 6.0 earthquake detected at the volcano. The second scenario is a tsunami generated by a magnitude 8.47 earthquake located along the Northern Panama Deformed Belt (NPDB). The participants may choose the scenario they want to participate according to the needs of their region or agency. The Puerto Rico and the (U.S. and British) Virgin Islands will use the Kick ‘em Jenny Scenario as agreed with the PRSN. The participant guides (Oficial Participant Handbook and PRSN Guidebook) are the basic tools for participation in the CARIBE WAVE 2019 Exercise. In a real situation, for an event like this one, a warning/advisory/watch of a tsunami, may last many more hours than is proposed in this exercise. This exercise has been adapted to be concluded in a compressed time. For the Kick-‘em-Jenny scenario, a magnitude 6.0 point source was used, therefore no other earthquake source parameters were required. The Shake Map for the Kick ‘em Jenny Scenario and the Prompt Assessment of Global Earthquakes for Response (PAGER) of the US Geological Survey are available in the IOC Participant Handbook. The Puerto Rico and the (U.S. and British) Virgin Islands participants will use the Kick ‘em Jenny Scenario as agreed with the PRSN and should refer to the CARIBE WAVE 2019 PRSN Response Guidebook for the Puerto Rico and Virgin Islands Region. 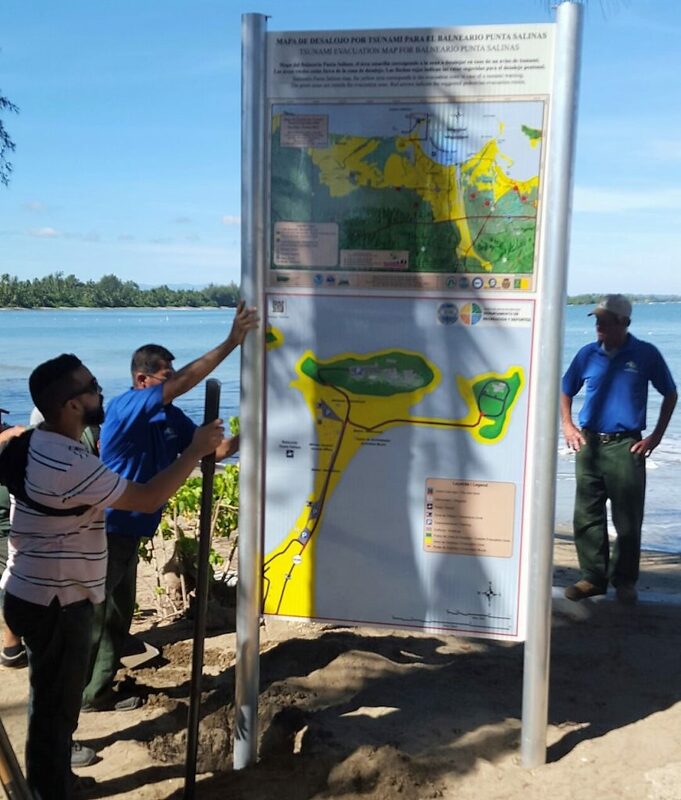 CARIBE WAVE helps prove that the evacuation plan for a tsunami in your town is a viable one and covers all the necessities during and after an emergency. 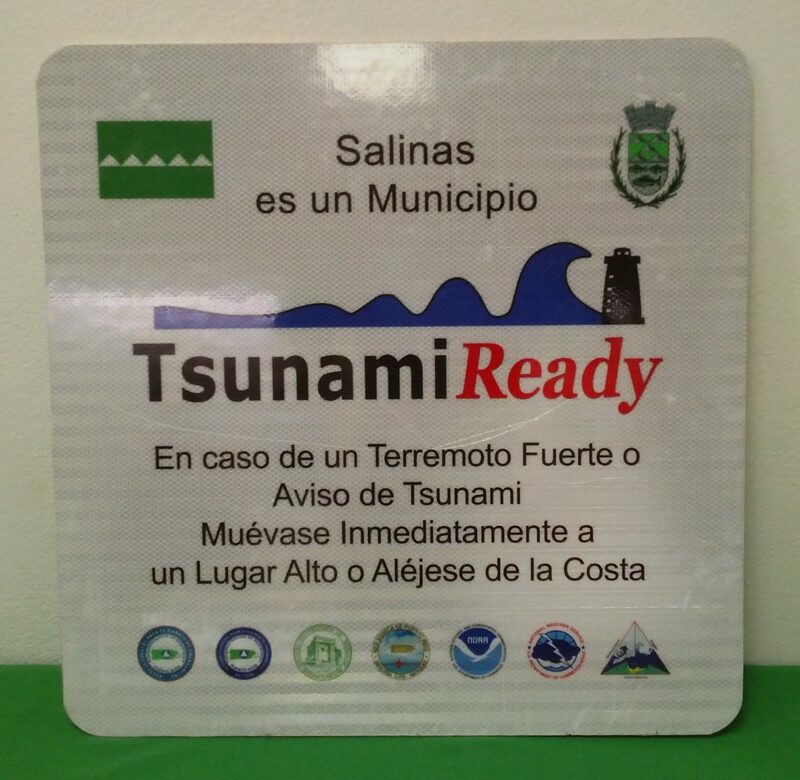 The TsunamiReady program was created by the NWS-NOAA to help communities be better prepared to save lives and reduce the damage caused by the occurrence of a tsunami. Tsunami generated by a flank collapse of the Kick ‘em Jenny submarine volcano. This collapse occurs after a strong earthquake of magnitude 6.0 Mw with epicenter at 12.16 km North of Grenada, Lesser Antille (Latitude: 12.342°N and Longitude: -61.658° W), at 10:00 am (Puerto Rico Local Time) on March 14, 2019. Participants of Puerto Rico, US Virgin Islands and British Virgin Islands should refer to the information on this webpage based on the PTWC domestic products and the CARIBE WAVE 2019 PRSN Response Guidebook for the Puerto Rico and Virgin Islands Region. The initial alert is disseminated at 10:05 AM (local time in Puerto Rico) as indicated in Table 1, Exercise Time Table for Puerto Rico and Virgin Islands for the Kick ‘em Jenny Scenario. The initial dummy messages will be disseminated over all their standard broadcast channels. 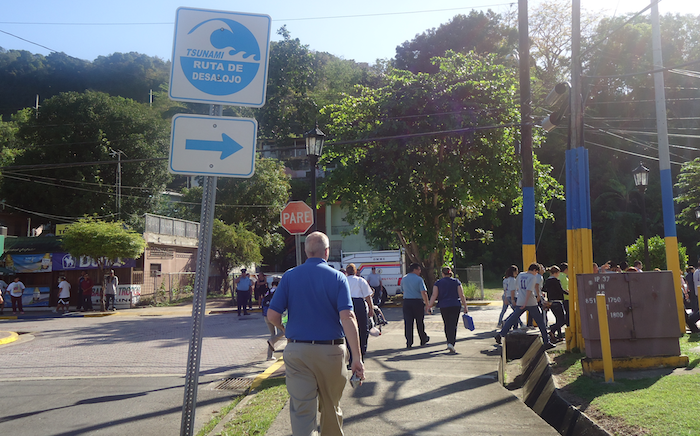 The dummy messages are issued to test communications with Tsunami Warning Focal Points and National Tsunami Warning Centers, and to start the CARIBE WAVE 2019 exercise. All messages will be sent to the recipients on the special email list used to transmit real messages in real time. Tsunami generated by a flank collapse of the Kick ‘em Jenny submarine volcano after a magnitude 6.0 Mw earthquake with epicenter at 12.342º N, 61.658º W occurring on March 14, 2019 at 1400 UTC. 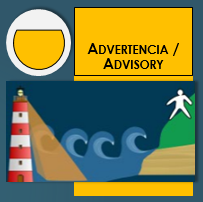 The Dummy Message is disseminated at 14:00 UTC and the initial bulletin with tsunami message is disseminated at 14:05 UTC, as established in the PTWC Domestic Products for the exercise. The purpose of the exercise is to improve Tsunami Warning System effectiveness in the Caribbean and Adjacent Regions. The exercise provides an opportunity for emergency management organizations throughout the region to exercise their operational lines of communications, review their tsunami response procedures, and promote tsunami preparedness. Regular exercising of response plans is critical to maintain readiness for an emergency. This is particularly true for the Caribbean and Adjacent regions, where tsunamis are infrequent but can be of very high impact. Every emergency management organization (EMO) are encouraged to participate. 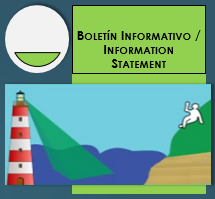 Each organization can develop its objectives for the exercise depending on its level of involvement in the scenario. The following are the exercise’s overarching objectives to exercise and evaluate operations of the CARIBE EWS Tsunami Warning System. Validate the issuance of tsunami products from the PTWC. Validate the receipt of tsunami products by CARIBE EWS Tsunami Warning Focal Points (TWFPs) and/or National Tsunami Warning Centers (NTWCs). To evaluate the tsunami procedures and programmes within Members States/Territories. Validate readiness to respond to a tsunami. Validate the operational readiness of the TWFPs/NTWCs and/or the National Disaster Management Office (NDMO). Improve operational readiness. Before the exercise, ensure appropriate tools and response plan(s) have been developed, including public education materials. Validate that the dissemination of warnings and information/advice by TWFPs and NTWCs, to relevant in-country agencies and the public is accurate and timely. Evaluate the status of the implementation of the pilot CARIBE EWS Tsunami Ready recognition program. Evaluate proposed PTWC CARIBE EWS products for volcanic events. Evaluate input from Seismic Research Centre (University of West Indies-UWI). Evaluate Member States and Territories response plans for tsunamis from volcanoes. The exercise should be carried out such that communications and decision making at various organizational levels are exercised and conducted without alarming the general public. Offices of Emergency Management (OEM) are, however, encouraged to exercise down to the level of testing local notification systems such as the Emergency Alert System (EAS), sirens, or loudspeakers. Exercises stimulate the development, training, testing, and evaluation of Disaster Plans and Standard Operating Procedures (SOP). Most countries in the region have participated in SOP workshops in 2013, 2014, 2015 and 2017, and should use the materials and expertise acquired to help guide exercise preparation and conduct. Annex I gives an overview of SOPs. Exercise participants may use their own past multi-hazard drills (e.g. flood, hurricane, tsunami, earthquake, etc.) 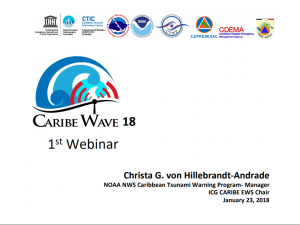 as a framework to conduct Caribe Wave 19. Orientation Exercise (Seminar): An Orientation Exercise lays the groundwork for a comprehensive exercise programme. It is a planned event, developed to bring together individuals and officials with a role or interest in multi-hazard response planning, problem solving, development of standard operational procedures (SOPs), and resource integration and coordination. An Orientation Exercise will have a specific goal and written objectives and result in an agreed upon Plan of Action. Drill: The Drill is a planned activity that tests, develops, and/or maintains skills in a single or limited emergency response procedure. Drills generally involve operational response of single departments or agencies. Drills can involve internal notifications and/or field activities. Tabletop Exercise: The Tabletop Exercise is a planned activity in which local officials, key staff, and organizations with disaster management responsibilities are presented with simulated emergency situations. It is usually informal, in a conference room environment, and is designed to elicit constructive discussion from the participants. Participants will examine and attempt to resolve problems, based on plans and procedures, if they exist. Individuals are encouraged to discuss decisions in depth with emphasis on slow-paced problem solving, rather than rapid, real time decision-making. A Tabletop Exercise should have specific goals, objectives, and a scenario narrative (see Annex II for a Sample Tabletop Exercise Outline). Functional Exercise: A Functional Exercise is a planned activity designed to test and evaluate organizational capacities. It is also utilized to evaluate the capability of a community’s emergency management system by testing the Emergency Operations Plan (EOP). It is based on a simulation of a realistic emergency situation that includes a description of the situation (narrative) with communications between players and simulators. The Functional Exercise gives the players (decision-makers) a fully simulated experience of being in a major disaster event. It should take place at the appropriate coordination location (i.e. emergency operations centre, emergency command centre, command post, master control centre, etc.) and involve all the appropriate members designated by the plan. Both internal and external agencies (government, private sector, and volunteer agencies) should be involved. It requires players, controllers, simulators, and evaluators. Message traffic will be simulated and inserted by the control team for player response/actions, under real time constraints. It may or may not include public evacuations. A Functional Exercise should have specific goals, objectives, and a scenario narrative. Full-scale Exercise: A Full-scale Exercise is the culmination of a progressive exercise program that has grown with the capacity of the community to conduct exercises. A Full-Scale Exercise is a planned activity in a “challenging” environment that encompasses a majority of the emergency management functions. This type of exercise involves the actual mobilization and deployment of the appropriate personnel and resources needed to demonstrate operational capabilities. EOCs and other command centres are required to be activated. A Full-scale Exercise is the largest, costliest, and most complex exercise type. It may or may not include public evacuations. Evacuation drill of a school in Aguadilla, Puerto Rico. Download the Participants Manual by clicking on the image. 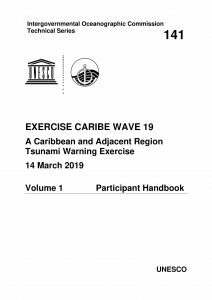 The Official Participants Manual for the Exercise prepared by the IOC (ICG/CARIBE-EWS) contains the scenarios with the information of earthquakes and tsunamis, the chronologic tables and the international messages emitted by the PTWC for the exercise. The Response Guide of the RSPR for the Puerto Rico and Virgin Islands Region contains all the messages for the Local Puerto Rico and Virgin Islands Region emitted by the RSPR based on the domestic products emitted by the PTWC for our region (Puerto Rico, United States Virgin Island and British Virgin Islands). The PRSN Presentations will be added soon. Download the Levels of Messaging for Puerto Rico and the Virgin Islands Poster by clicking on the image. 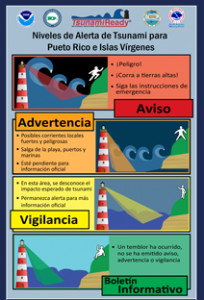 The Tsunami Level Alerts for Puerto Rico and the Virgin Islands were developed by the NTWC and is focused on informing the risk level of a tsunami happening, in this case, in Puerto Rico and/or the Virgin Islands. 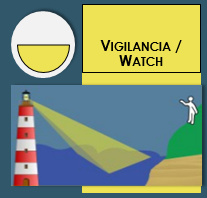 The alert levels are divided into 4 color coded categories, each respective to it’s own category. 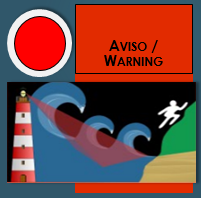 Possible strong and dangerous local currents. Stay tuned for local emergency guidance. No Warning, Advisory or Watch issued. A distant ocean basin may be in danger.